Sometimes, you just want things to be nice and straightforward. Perhaps you are sick of stories where the main couple dances around each other for chapters on end, afraid to say a word to each other. Other times you may find yourself utterly frustrated by the fact that its been two whole volumes and the hapless lovebirds still haven't kissed yet. Even better, they cant even hold hands without one of the pair erupting into a bright beetroot color from the sheer, unrelenting embarrassment of the act. Give me a break. First things first, Love Roma is not the prettiest of manga. In sharp contract to the majority of romance manga, the series forgoes the usual painstaking detail and instead opts for a chunky, thickly lined look. The simplistic designs and lines make the characters look youthful as well as downright cartoonish, establishing the series firmly as a romantic comedy rather than a hyper-dramatic weeping fest. As an upside, all of the characters are readily identifiable due to large differences in individual character designs, something I usually have problems with in romantic or more ornately drawn series with extended casts. Expressions are clearly readable on characters faces and body language is obvious, making the emotional aspects of the story much more accessible and, frankly, more enjoyable to read. The art is full of other nice flourishes, such as the white outline that surrounds characters and so pops them out of the background, the effect differing depending on situation or mood, a nice extra touch to the art. The whole presentation has a levity to it that that makes it hugely enjoyable and immediately accessible to me. I already touched on this, but one of the main reasons I enjoyed Love Roma was the main couple—both are honest, slightly dull normal people. Hoshino, the main male, is flat out blunt with his thoughts and feelings where as Negishi is straightforward while still having a tendency to get embarrassed over romantic things. Its a nice coupling that leads to a lot of amusing situations both between the pair and interacting with the extended cast of their friends. An extra bonus is that they start going out at the end of the first chapter. Holy hell! A series where the main couple don't dance around each other for 2+ volumes, its a bloody miracle. Of course, they are still high-school kids, so its not like they are discussing mortgages or other dull junk in chapter three. In fact, the slapstick comedy is actually quite sharp, making me laugh out loud quite a few times while reading. The rest of the cast are enjoyable to read as well, and strike a nice balance between developing their own relationships and personalities at their own pace while the main romance storyline is told. An issue that arises with some series that that the secondary characters become more interesting than the supposed main characters, something that is neatly sidestepped in Love Roma while avoiding the pitfall of relegating them to background filler. 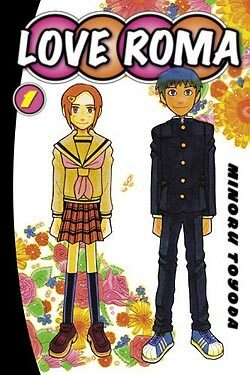 One worry I have is that the premise may not last—in the first volume alone the couple go on their first date, have their first kiss, and are introduced to one of the sets of parents. While there is a more than plentiful set of side characters who are introduced and are able to have their own adventures or spice the main plot up, I worry that the series may run out of ideas and fizzle out too soon. I intend to continue buying the series, and will let you know what I find. However, as a first volume on its own it is a refreshing read that I would heartily recommend, particularly if you want to have a laugh while going "Awww...."
This review is based on a retail copy purchased by the reviewer.